Animals and kids sure know how to charm their way out of a sticky situation. 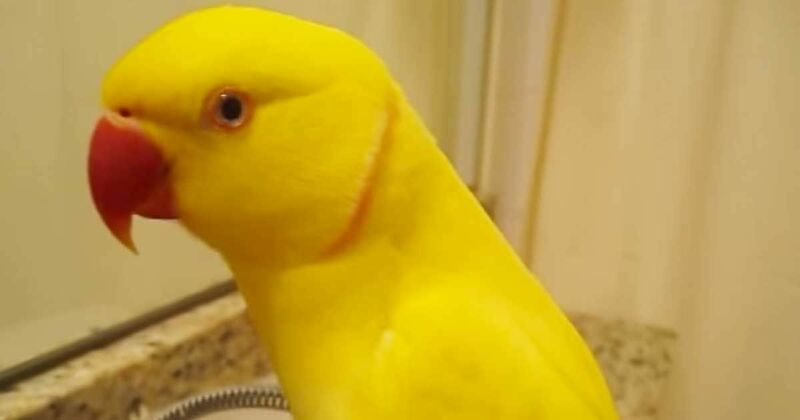 Well, Bowie the Tweety-Bird-yellow Lutino Indian Ringneck is no different. In fact, Bowie's antics left us in hysterics. The viral video, which has been viewed more than 1 million times on YouTube, starts out with Bowie's mom telling the tenacious little bird to stay out of her makeup. Now, we're not sure what kind of trouble Bowie got into before the camera turned on - but Mom doesn't seem too happy. In response to his mother's tone, Bowie tries to lighten up the situation by telling her, "smile!" These birds are known for mimicking, but by using the charming phrase, he actually manages to make his mom grin. It doesn't last for too long, though, as mom tells her little guy, "I think you're confusing it with the word 'sorry.'" Bowie starts telling his mom to 'smile' again, and she tells him she's not laughing - in that classic mom way, where she really is on the inside. The video is just too cute to miss! Check out the viral clip right here below. And don't forget to share this adorable video with your friends on Facebook, Twitter, and Pinterest!